Over the past five years, whites in Chicago were almost seven times more likely to have their police misconduct complaints sustained than African-Americans, even though blacks filed three times more complaints against police officers, according to an analysis based on a new public database. 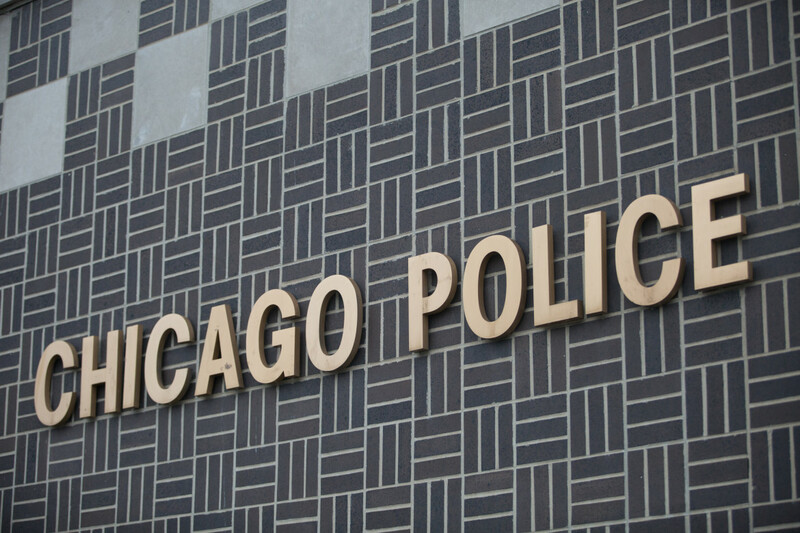 The Chicago Police Department’s Internal Bureau of Investigation and the Independent Police Review Authority examined about 17,500 complaints of police misconduct between March 2011 and September 2015 in which the complainants were not anonymous. Of those, 61 percent were filed by African-Americans, 21 percent by whites and 12 percent by Hispanics, according to an analysis by The Chicago Reporter and City Bureau, a Chicago-based newsroom and journalism training lab. But of the complaints sustained, only 25 percent were filed by African-Americans, compared to 58 percent by whites and 15 percent by Hispanics. Each group represents about a third of the city’s population. 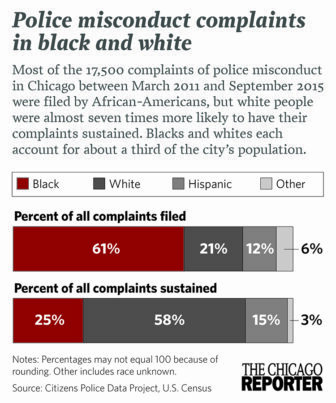 The analysis of police complaints is based on the Citizens Police Data Project, a website containing misconduct complaint records for more than 8,500 Chicago police officers. The project is under the umbrella of the Invisible Institute, a nonprofit journalism production company, which released the information on Tuesday. A collaboration with the University of Chicago Law School’s Mandel Legal Aid Clinic, where Futterman works, the project is believed to be the most expansive public database of its kind. The project’s goal is to encourage more transparency and accountability by police—and to give everyday people easy access to complaints. A Chicago Police Department spokesman said the agency wants to foster trust with the communities it serves and that it has invested in nationally recognized training to improve relationships between officers and residents. In addition, the department has implemented early warning systems to help identify potential concerns with officers’ actions and arrange for training. Overall, 56,361 misconduct allegations from 2001 to 2008 and 2011 to 2015 were analyzed by the data project, which found that more than 96 percent of cases were not sustained. A single complaint can contain multiple allegations, each of which is investigated individually. For example, a complaint could include allegations of excessive force, verbal abuse and conduct unbecoming of an officer. If only the verbal abuse allegation is substantiated, however, the Police Department would include the entire complaint in their data of sustained cases. Critics say that can make the sustained complaint rate appear higher. An analysis of individual allegations–compared to complaints–shows that the discrepancy between white, black and Hispanic complainants is even more stark: Allegations by whites are nine times more likely to be upheld than those by blacks and almost three times more likely than those by Hispanics. One possible explanation is that some of the allegations by whites are coming from other officers on the force, which is 52 percent white, according to 2013 statistics. The allegations that are most likely to be sustained are those about alcohol abuse and administrative missteps, like misuse of department supplies and insubordination. Those allegations are also much more likely to be filed by whites. On the other hand, allegations of improper arrest and lockup procedures are much more likely to be made by African-Americans and are sustained less than 2 percent of the time. A black person’s chances of having a complaint upheld increased when the accusations were made against a black officer. Kalven obtained data for the police project from lawsuits and Freedom of Information Act requests starting in 2007. Experts said they were surprised by the relatively low percentage of complaints by Hispanics, given their numbers in the city. National studies suggest that fear of retaliation and a belief that officers will not be disciplined discourages many Hispanics from filing complaints. Immigration status might also play a role. Black people are more likely to have police encounters and be in situations that are likely to produce complaints, several experts said. They pointed to “stop and frisk” practices and studies showing that African-Americans are more likely to be targets of traffic stops. Releasing data doesn’t, in itself, eliminate misconduct, Futterman said, but the problem is harder to address if facts are lacking. White people as a whole are less likely to fight with police or immediately start yelling they can’t breath before they are even touched. Marginalized attitude, yes conservative “optimistic” well this doesn’t effect my life? Not bright frightening, when say …socialism public administration basically “NAPO” continue harass those not consider of merit. Example when police stop usually determine your address factor also forgotten “LGBTQ” Chicago many law suits. Pursuit of respect of citizens, yes called Boystown this Deb Mell and Tom Tunney area why racism from police. Repeal is needed, concur many law enforce getting personal yes impartial attitude is not loyalty to law enforcement economic connections how? Personnel and contracts, right going adamant to protect the oppression “LGBTQ” facing discrimination police depts. Repeal is needed where tax payers whom allowing bigotry “mayoral office” time for change “gentrification” effected many Chicago going to worsen laws not enacted to stop abuse. NYC (Stop n Frisk) failure to resist retaliation this racism liberty now!